Balinese garden designs feature bright color, jungle-like flowers, embellishments and water. 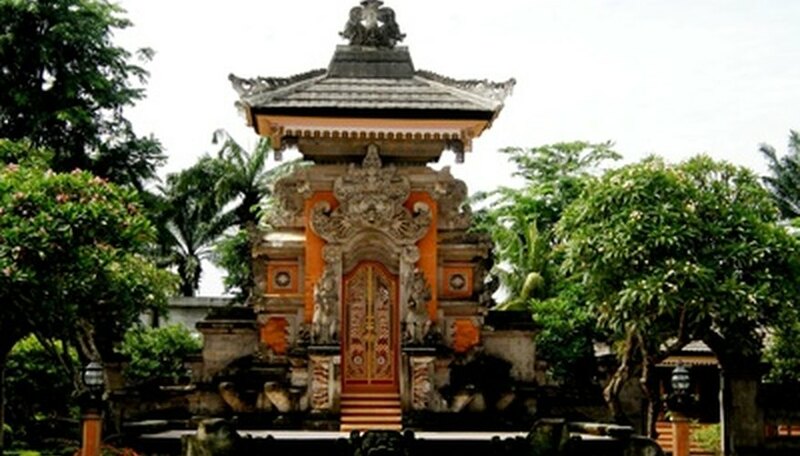 If you already have one of these elements in your garden, a Bali garden can be a good option. It is a great concept for entertaining friends, creating a serene sanctuary for yourself or just adding more foliage to your landscape. Deciding what elements to put into your Balinese garden depends on your style, space and budget. Since Balinese designs are Asian-inspired, intricate details and embellishments are all over the decor. Consider adding Buddha statues or heads in corner spots of the garden, or add teak benches (teak is used often for furniture in Bali) to sit in a serene space or beside a water source. Bali gardens utilize statues a lot, specifically of animals such as a tiger, elephant or birds, or of religious figures. Other things can be added to corners like baskets, vases, pottery, gates, wall panels, plaques, lanterns and ceremonial umbrellas. In a Bali garden design, plants and flowers are very integral, because Bali has tropical jungles. Use large, ornate, colorful flowers to decorate your garden with classic Asian plants like bamboo, water lilies, moss, large ferns and orchids. Try to create a sanctuary-like effect by enclosing the garden in larger shrubs or trees around the edges. Balinese design is know for bright colors, particularly orange, red, gold and indigo. You can incorporate these colors in any way possible, but just a touch here and there is enough. Use these colors with the embellishments, candles, furniture cushions, planter pots or flowers. Lighting in the garden will not only highlight certain features like statues, it will also let you entertain in the evening time more efficiently. Consider some decorative lanterns to hang around the garden edges in bright or subtle colors. You can even use candles positioned around the perimeter—just be sure to keep an eye on them so there is no fire hazard. Adding water to your Balinese garden can enhance it significantly, as it can add dimension to any type of garden. Whether it is a small plug-in fountain, bowls filled with water and lilies or a large rock waterfall, this feature will add tranquility and natural beauty to the landscape. These are symbols of the eastern culture, especially if you incorporate Asian plant life or marine animals like fish or frogs.